Bicentennial Buckeye Tree Planting is a picture, with genre photograph. Its dimensions are 4 in. x 6 in.. It was created in 2002. Worthington Estates School is the Contributor. 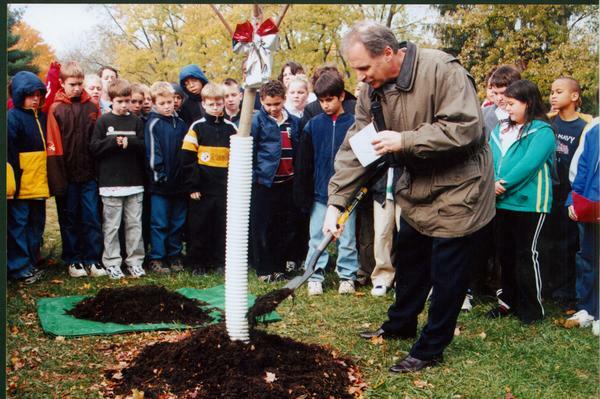 A buckeye tree was planted on the grounds of Worthington Estates School during the 2002-2003 school year in celebration of the 200th anniversary of the founding of Worthington and the statehood of Ohio. Dan Williams, Principal, is pictured turning the earth with a shovel as students look on. The Ohio buckeye, or Aesculus glabra, is native to Ohio. Its large shiny brown nuts resembles deers' eyes, hence the name 'buckeye'. It covers the topics elementary schools, centennial celebrations, trees, school officials and employees and students. You can find the original at Worthington Estates School. The Worthington Memory identification code is wes0007. This metadata record was human prepared by Worthington Libraries on June 25, 2003. It was last updated November 17, 2017. Spring is in the air! We invite you to celebrate both National Poetry Month and the long-awaited arrival of spring buds and blossoms by looking through some of our scrapbook and news items that feature gardens and poetry. This collection features the ways in which schools in the Worthington School District celebrated the 200th Birthday of Worthington and Ohio. Special Bicentennial projects were completed by students in the Worthington School District during the City's year-long celebration.